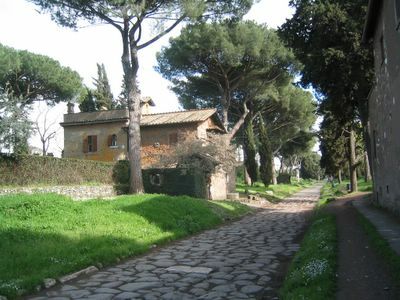 This road way in Rome is near the catacombs. It was built round 300 BC. On our trip to Roma we rented bicycles and road along this road. These types of trees are all around Rome. The road surface makes it very difficult to ride bikes, so many people ride on the dirt paths along the edge. This photo was taken with a Canon Powershot S230. This is a way of really wonderful Rome. The trees of the circumference add beauty.